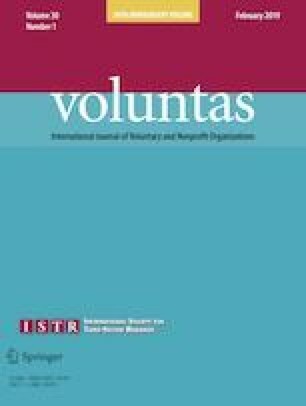 Using data from a sample of 301 Australian disability nonprofit organizations (NPOs), this study applies configurational thinking to identify combinations of organizational capabilities that lead to Nonprofit Social Innovation (NSI)—a new service or process that promotes social inclusion of people with disabilities—and examines whether NSI is a sufficient condition for high societal impacts to be achieved. The conceptualization and components of the NSI framework were developed in our previous research through a two-month researcher-in-residency at disability NPOs. In this study, we employ fuzzy-set qualitative comparative analysis to identify several “recipes” of capabilities (varying by organizational size and geographical location) for NSI development. The analyses find that high societal impacts from NSI occur when organizations adopt diverse perspectives, and embrace either person-focused approaches or operate in a risk-tolerant environment. These findings provide valuable linkages to managerial practice in nonprofits and advance emerging theoretical understandings of social innovation. The lead author would like to acknowledge financial support received through an Australian Government Research Training Program Scholarship. Australian Bureau of Statistics. (2014). Regional Population Growth, Australia, 2012–2013. http://www.abs.gov.au/ausstats/abs@.nsf/Products/3218.0~2012-13~Main+Features~Main+Features?OpenDocument. Accessed February 10, 2017. Jankel, N. (2011). Radical (re)invention: A white paper. http://jbctm.files.wordpress.com/2011/05/radicalreinvention.pdf. Accessed November 4, 16.